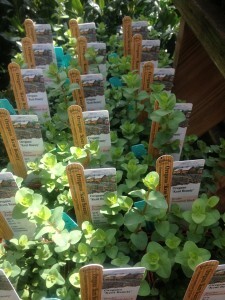 ‘Kent’s Beauty’ Ornamental Oregano – It’s Here! 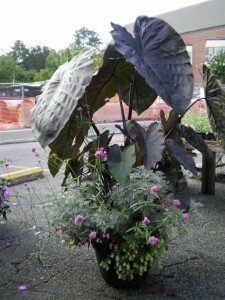 Remember the pretty gray/silver leaved plant with the pretty pink blooms we had at Christmas and also into January? 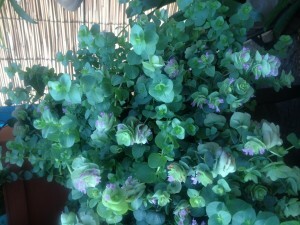 It was an ornamental oregano called ‘Kent’s Beauty. Forced into bloom for the holidays by growers on the west coast, we have it now from local growers – admittedly much smaller and not blooming – yet! If you plant this little one now though, you’ll have the same pink blooms this summer on a trailing plant that works well in containers and window boxes. This oregano plays well with other sun loving plants, including zinnias, sun coleus (it looks especially nice with a contrasting dark leaf) pentas, angelonia, gomphrena and of course, other herbs. It might be smaller, but it’s the same plant to put in your pots now! 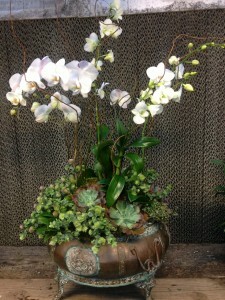 Always use light potting soil (we carry Fafards and plant all of our containers with it) water regularly especially during the hottest months, and cut it back when it has bloomed itself out – you’ll still have the pretty foliage. Just be sure to remember the name because your friends will ask! This entry was posted in Container, Herbs, Summer, Uncategorized and tagged kent's beauty oregano, ornamental oregano, plantings for sun on April 22, 2013 by Kris Blevons.